Here’s a post before my long, weekend paddle. I’m returning to the San Juaquin River tomorrow to paddle a new section, solo. Sixteen and-a-half miles down river; Two Rivers to Mossdale County Park. My partner’s taking me back to the beginning, and I’ll be starting over for a total of 33 miles. I want to continue training in rivers and I can’t even think about going against the current for that long of a time. Even though last weekend was down river (43 miles), we were slowed by so many trees in the water. I wanted to get a better feel for trying to keep a sort of, “race pace.” I’m suppose to do more mileage, but next weekend will be 45 to 50, so I feel OK about taking it a little easy this weekend. It’s starting to get exciting (and anxious; it’s friggin’ far). A couple of people who read my blog sent me good wishes for the race. 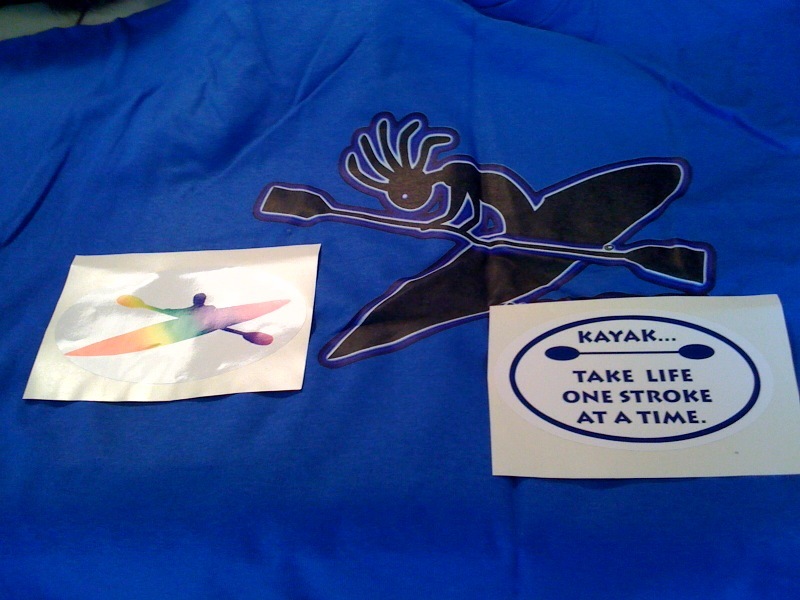 Today I received a package in the mail from a friend; a nice T-shirt and some stickers. Then this afternoon I started some preparations for my kayak. 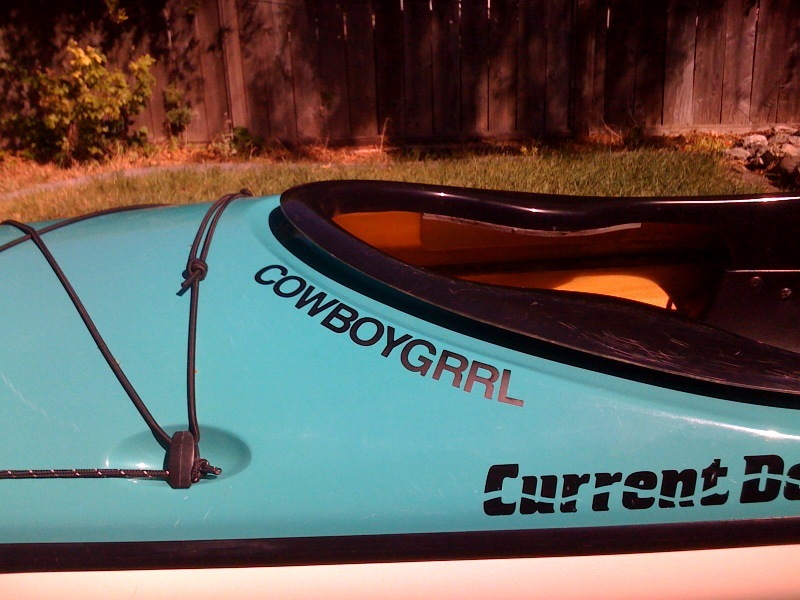 I put one inch letters to add my name to my boat. 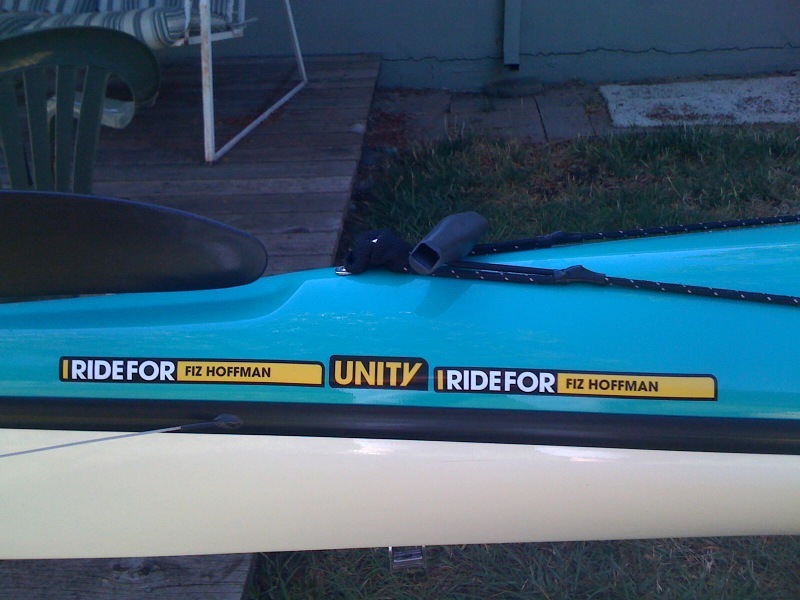 And because I paddle for all 28 million cancer survivors, I paddle for two special friends. One long-time friend has a sticker with her name on it. This entry was posted on August 14, 2010 by DummyDiva. It was filed under Uncategorized and was tagged with Colorado 100, Mossdale County Park, San Juaqin River, ultra marathon kayak/canoe. Looking good! You certainly have put in the preparation. Good luck! Thanks so much for your words of support.